I remember learning about the Enlightenment era many times in school. Whether discussed as the ‘siecle des Lumieres’ or simply the 18th-century, never once was mentioned the crossover between Christianity and Islam, Europe and the greater expanses of the Near East, or how these exchanges arguably made the expansion of literature and innovative thought possible. In Stranger Magic: Charmed States and the Arabian Nights,” Marina Warner dissects the interweaving of European culture and the stories now known as the Thousand and One Nights. Tracing the motifs of Arabic and Oriental storytelling, Warner facilitates the reader’s introduction to the Arabian Nights as known today as a cross-cultural literary phenomenon, augmented through imperfect translation and satirical embellishment. The writing is smart and effective–no academicese found here. Wrapping tales within tales within explanations, Warner stylistically imitates her subject while also making it possible for the reader to draw his own connections between these storytelling patterns and other Western literature. Slowly, the literary Berlin-wall between Eastern/Oriental literature and all that came from the west is deconstructed. Myth and history merge, as do cultures thought of as separate even now. Warner connects established tropes to seminal works of English literature, postulating on the migration or the tropes across cultures and geographies. 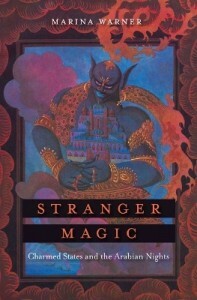 Challenging common ideas regarding the root of Western magical thinking, Warner’s research constantly reminds one that the 18th-century obsession with Orientalism marked a profound shift from not only Western rationality, but also the strict Christianity-based paradox between good and evil, and the place of magic on that scale. Another cross-cultural phenomenon is marked: the borrowing of justifications of the good or evil of magic by scholars of the Koran, to create a cultural space for magic in the west. I can write for days explicating the lessons in literature, history, myth, folklore, and religious and cultural studies outlined in this book. But what all of my writing would amount to would be to say: read this book. As we age and fairy tales become relegated to the shadows of childhood, it is easy to forget that these tales of magic and mystery were intended for all ages, and often, not at all for children. It is easy to forget that there is more to learn about ourselves through how we read and retell fairy tales, how we borrow tales from other cultures and then retell them. Beyond being ‘charmed,’ there is a vast historical, political and cultural dialogue to be discovered in tales of magic and enchantment. Warner’s Stranger Magic is a phenomenal introduction into the other side of reading fairy tales. I wholeheartedly recommend Marina Warner’s Stranger Magic: Charmed States and the Arabian Nights. Though a longer, slower read, the book is a brilliant reintroduction to a tome of underappreciated tales that have done much to shape many cultures. Whether serious academics, or those just looking to learn a little bit more, this book has a little for everyone. Fairy tales are a portal into different worlds. So often now adapted for children and teens, I was delighted to find a work that, though written to educate instead of enchant, captivated my mind as well as any of my old favorites.